American Country Music Awards 2011, originally uploaded by DianthusMoon. I try not to miss an opportunity to snap a photo of my favorite singer of almost 40 yrs when he is performing. 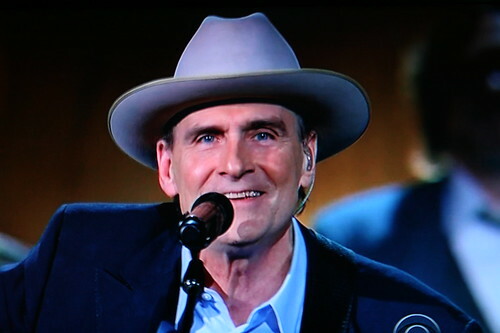 James Taylor was singing along with the Zac Brown Band on the 2011 American County Awards and looks like he is really enjoying it. Domestic goddess, wife, mom, gardener, paper and collage artist, geocacher, local traveler, cross stitcher, baker, crafter, Facebooker, blogger, decorator and photographer. Don’t forget to leave your comment at The Saturday PhotoHunt. I hope to see y’all next Saturday… We will be ‘Reflecting’ next weekend! Great picture and so close up. Thanks for stopping by my blog! I hope you enjoy your visit. Click throughs-help some and enjoy plenty!